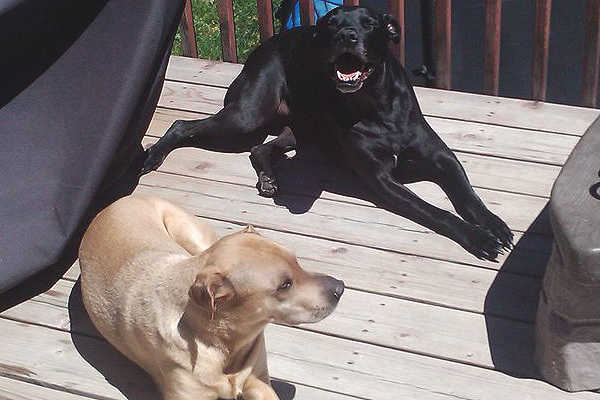 I have four children: two beautiful daughters and two awesome pit bulls. My girls do not know life without their pit bull brother and sister. Chase is our only boy and the oldest. My husband fell in love with him at the humane society shelter. He’s a pit bull/black Lab mix. Before we went to the shelter, my husband had in mind getting a small dog. I had pit bulls growing up. I had been trying to talk my husband into adopting one, but he was pretty reluctant. He was smitten the moment he met Chase, and a few days later we had officially become a pit bull family. Chase was our only baby for a little over a year and a half. Then, my family came to visit for spring break. My brothers had gotten a cute pit bull/Shar Pei mix puppy for their birthday. The puppy came to visit, too. Chase was thrilled to have company, and at the end of spring break we decided to keep Bella. By then, baby number one was on the way. Six months later, our oldest daughter joined the party. Our pit bulls were super curious about the new person in the house. Baby girl got “pit bull kissed” quite a few times (you know, once a pit bull starts kissing, he can’t get enough of it!). Things got a lot more fun once lil’ sis was old enough to play and, of course, share her food with the doggies. A couple years later, another baby girl joined the family, and let me tell you that she’s the biggest dog lover! Our youngest and Bella truly are best friends. Bella has shined as a “good with kids dog” since baby number two got old enough to play with her. Our bully girl loves attention and affection, and having somebody who wants to play with her and pet her all the time has made their relationship extra special. A couple months ago, I took my girls to the shelter where Chase came from. Pit bulls were definitely what caught my girls’ eyes as we walked around the shelter. I wanted them to see what Chase had gone through and why he’s an extra special dog. While at the shelter, our littlest one said “puppy so sad.” Her big sister explained to her that all those dogs were so sad because they didn’t have a home or a family, and then she started crying because she really wanted to give all those pit bulls a home. Since that day, she talks about adopting pets from the shelter and will even play adoption with her stuffed animals. She has also come to appreciate her dogs in a different way. 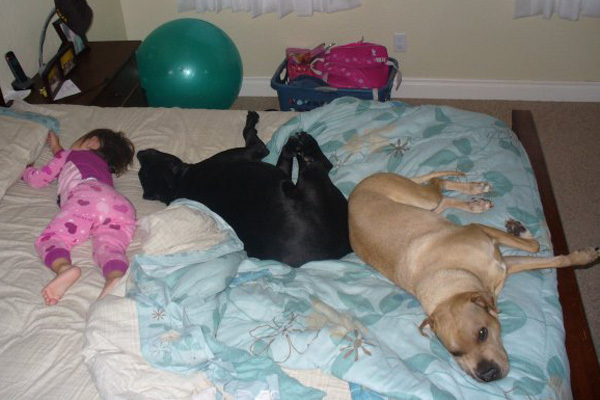 I’m truly grateful for our pit bulls and for my daughters not knowing life without them. Our life with dogs is different from other families only because we get the extra special love that only pit bulls can give. There is no additional concerns or precautions, just an awful lot of love. God Bless you for creating such a loving and caring home for all of your kids!!! @danalee So true as you can see from the photos, nothing but love in that house! Too cute and thank you for educating your lovely daughters about dogs especially pit bulls. What a lovely post and a happy family! Thanks StubbyDog for featuring my kids! My dogs are simply that, just dogs. Capable of loving and living with a family and with kids just like all other breeds. 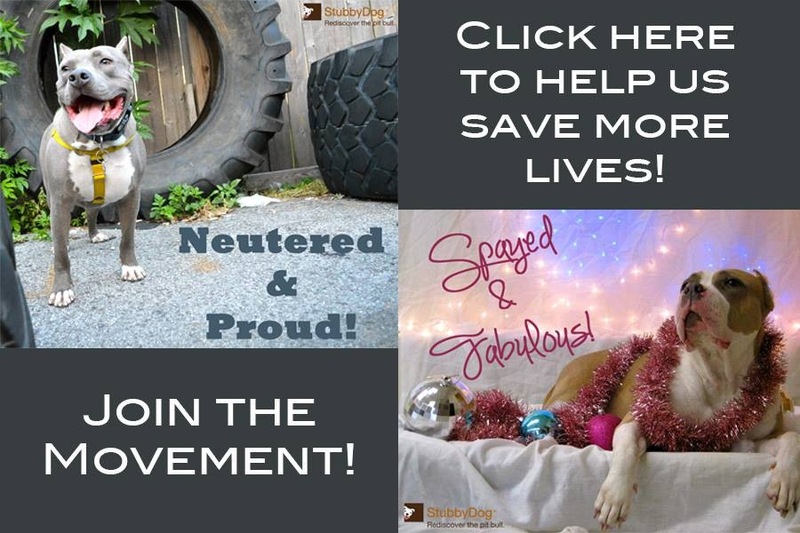 We’re really excited that we get to be part of doing away with bad pit bull stereotypes. @airyzm Thank you Airy for sharing your wonderful story with all of us! What a great story and wonderful photos. Thanks Stubby Dog for all you do. p.s. I like that loveseat. Awww! 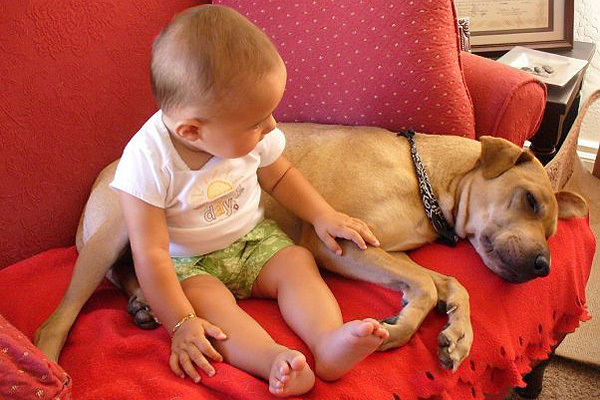 Thanks to your family, there are two pit bulls about whom no one can say “puppy so sad.” Your story warms my heart. @dragondix2 Thanks, it warms our heart too. StubbyDog gets me every time. I cant read a story on here without crying!!! Happy tears are simply the best!!!!! Thank you to all the wonderful bully lovers out there!!! You warm my heart!!!! @ReneeMKeller We are crying happy tears all the time too. Thanks Renee! Love it Pitbull Mamma!!!!! 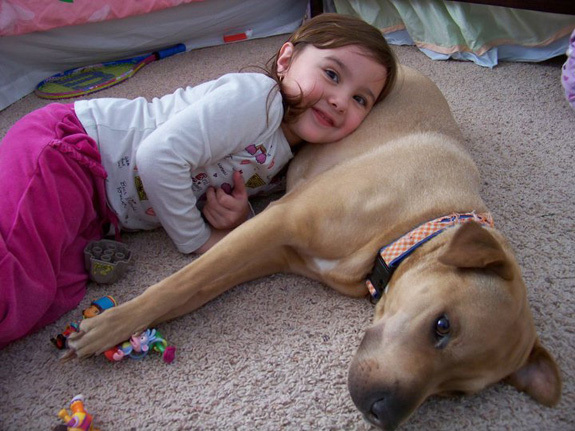 Plus, you are raising 2 beautiful girls who have love for animals…what a joy! Thanks everyone for your comments! We are fortunate to live in a place were there is no breed bans and our dogs are not stereotyped everywhere we go. While job hunting last year, we had to pass on quite a few opportunities because of BSL. Just sad that the bully breeds get discriminated against in so many places. Bullies are wonderful family dogs. Would be awesome if all of them had a couch to lay on, a place to call home and loving kids to play with. So with you on that. 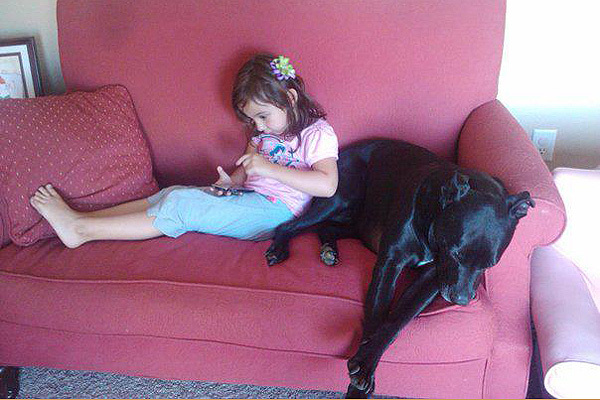 Someday, working together, we can have a comfy couch for every pit bull.